I’m going to New Orleans on a family vacation this week, so I finally dove into my list of related reading. 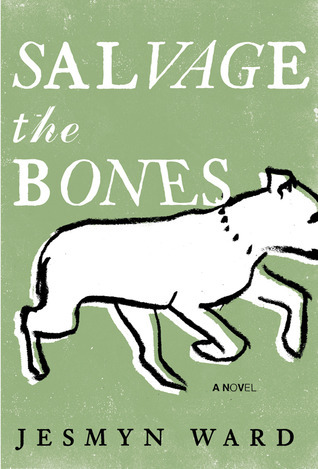 I read part of The Sound and the Fury, and then finished Salvage the Bones by Jesmyn Ward. I know that neither of these books are actually set in New Orleans–or even in Louisiana–but they’re close! So why did it take me so long to read this book? I’ll admit–I have a slight bias against graphic novels. It’s not that I don’t think they’re worthy or valid or just as good as other forms of literature, but, for me, I usually think they tend to do too much. I like to meet the work I’m reading halfway, but I think, in some cases, graphic novels, by supplying both words and images come at me with more than half the work done already. 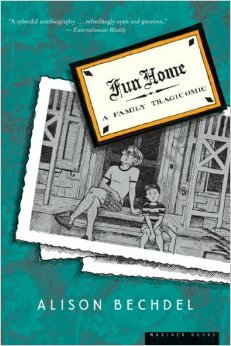 Honestly, this was somewhat the case with Fun Home, though, so I think I might just be wrong. The words compliment the pictures, which, as the best “illustrated” works do, don’t illustrate the pictures but tell complimentary, but different, pieces of the story. The images were often witty, self-effacing counterpoints to the words, or lent ambiguity to what might seem more decisive if limited to pure text. Bechdel’s book is a memoir, covering her childhood until her father’s death, while she was in college and he was in his forties. The story isn’t linear; at times chapters retread different time periods, but revealing different information and perspectives. In this way, she starts with broader information about her family and then goes psychologically and thematically deeper as the book progresses. The book as a really careful, calculated, but seemingly natural structure. This is a moving, complicated, beautiful book that I’ll probably read again. I’ve had Far from the Tree on my to-read list ever since it came out in 2012. I was very happy to receive it as a gift for Christmas this year, but as soon as I started reading it, I realized that I should have gone out to buy it myself three years ago. Words like “monumental” and “life-changing” get bandied about in relation to this book, and honestly, they’re not exaggerations. This is a truly important book; it’s scope and subject matter reframe the world. It is also a mind-boggling achievement. Researched for what must have been at least twenty years, over 700 pages long, not counting the extensive notes, and extremely wide-ranging in its breadth, I literally can’t imagine how Solomon managed to put it together. Very early in the book, Solomon presents his organizing principle: vertical vs. horizontal identities. Vertical identities often are shared between parents and children: race, nationality, religion. Horizontal identities often are not: trans, deaf, gay. Of course children can be of a different race than their parents and children of gay people can also be gay–this isn’t an absolute distinction. 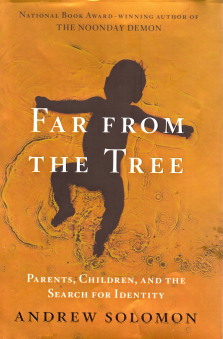 What Solomon delves into, though, are the relationships between parents and their children whose assorted horizontal identities that they don’t share. He profiles particular people and families, goes into various movements’ histories, explores science and morality, and inserts his own experiences, impressions, and interpretations. It seemed, at least to me, that he did a really good job presenting a cross-section of experiences, including families of diverse of socio-economic, racial, ethnic and religious backgrounds–although he immediately admits that there is an element of self-selection in terms of his subjects which may skew the perspectives he presents.